Frame Brace connects front suspension member and first front vehicle frame. Its add rigidity of front overhang for better steering response and stability during cornering. 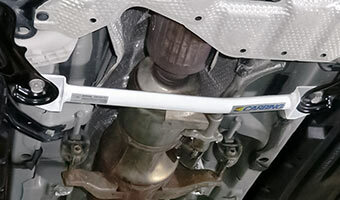 ･Okuyama Frame Brace uses 20x40(mm) oval shaft for better torsion rigidity. ･Made of steel. White color powder coated paint for scratch registants.